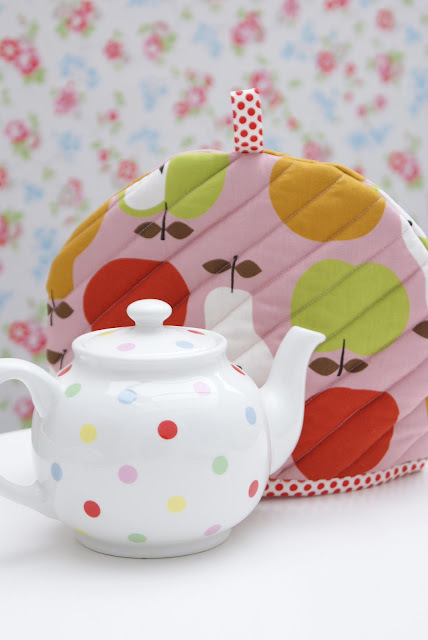 As I promised last week, I'm back today to share with you all my step by step tea cozy tutorial. The following measurements fit my standard four person teapot. I hope you can follow my instructions easily :) if you have any questions at all, please let me know. 2. Lay your interior, batting and exterior on top of each other forming a 'sandwhich' as shown above. You need your interior and exterior prints facing outwards. Pin in place. 3. 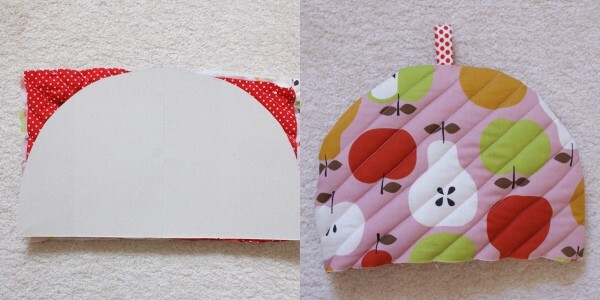 Starting from the centre of this 'sandwhich' begin sewing 1" diagonal line. Repeat this until you have quilted all of it. Repeat step 2 and 3 for the other side. 4. I used a template to cut out my teapot shape, but more easily you can draw around a large dinner plate for the cirular shape at the top. Cut out. 5. Not pictured (as I got a little ahead of myself!) 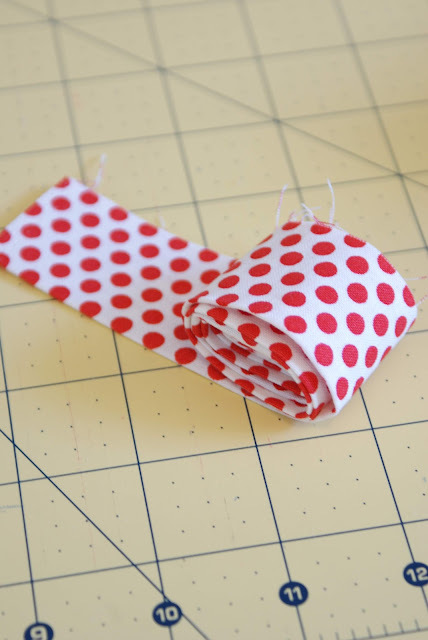 cut out a peice of coordinating fabric for the loop measuring 3.5" x 2.5". 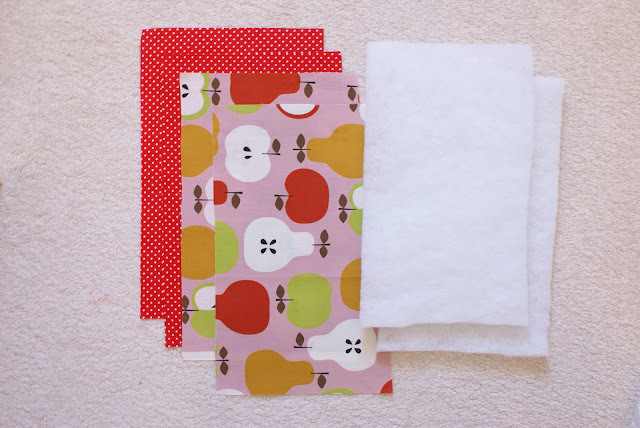 Press in half, then fold over the edges to the centre where your crease is, fold again and sew. 6. Lay your two teapot pieces right sides together, with your hanging loop folded in half (so it's poking through the exterior). Sew 1/4" all the way around the circular top. 7. Cut a peice of coordinating fabric for your binding measuring 27" x 2.5". Press in half width-ways. 8. Sew your binding on, and you are done! Very nice! And so cheery too. So cute! I may need to make one for my teapot! So cute, gotta make one, or two! 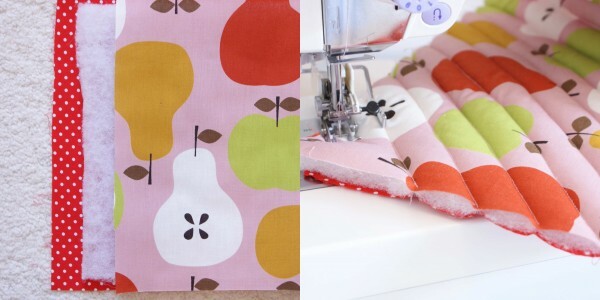 Looking for ideas for our fall fair this year (the theme is Pumpkins Spice and Everything nice) and I do believe I'm going to use your pattern to make one to enter. Thanks for posting this! Hi, what is the name of the material you used for the exterior of the tea cosy and where can you buy it. Thanks so much! I made two today. One for myself and one for a friend. This was my first quilting anything project. It was fun, but I had some trouble keeping my lines straight and the back of the fabric from bunching when I wasn't looking. Any suggestions or little tricks? I just made one last night. 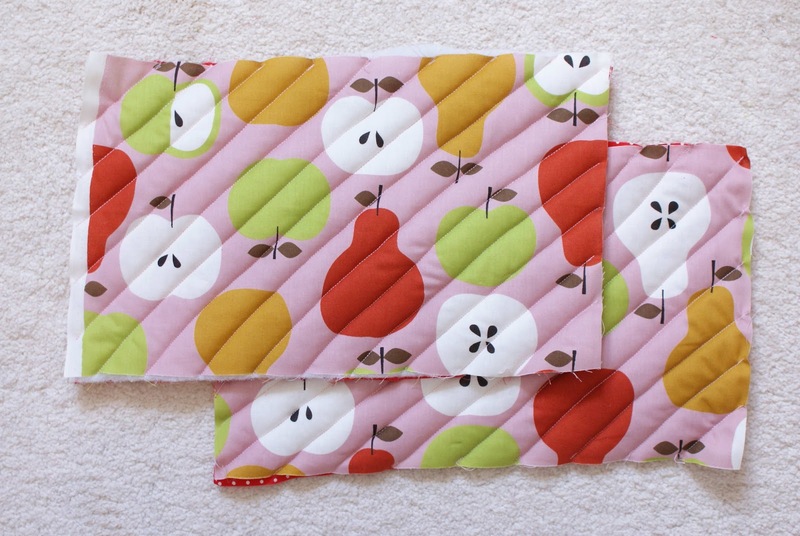 It was my first ever quilting anything project too. I was a little sloppy with the binding and it's very very snug on the teapot, but it came out pretty nicely. Pic to be posted soon. 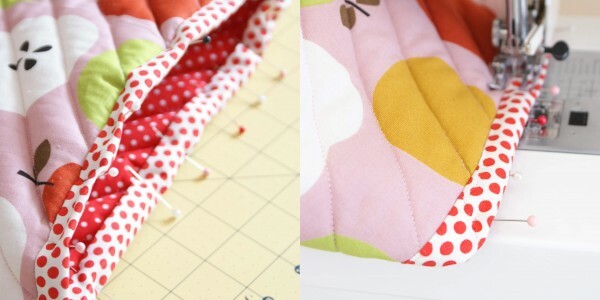 im a bit confused when you sew the two pieces together what happens to the inside seam? is it visible on the inside? 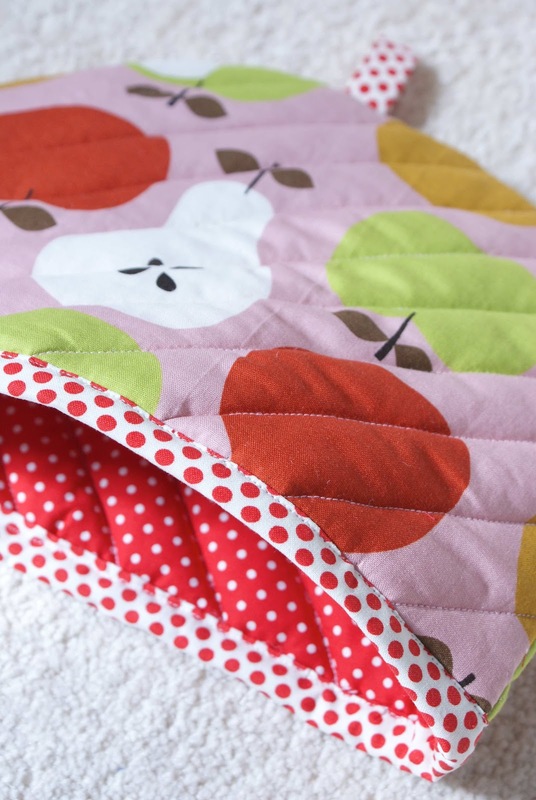 question: will you see the 1/4 in seam when you turn it inside out? اگر دچار خارش مزمن و طولانی مدت ناحیه تناسلی هستید بهتر است از خرید کاندوماستفاده نکنید. همچنین ژلهایی که به عنوان ژلهای روان‌کننده به فروش می‌رسند از عوامل مهم ایجاد حساسیت، آلرژی و خارش در ناحیه تناسلی هستند. استفاده از این ژلها حتی برای کسانی که مشکل خارش هم ندارند توصیه نمی‌شوند. رخی از بیماران بوجود آمدن خارش و یا سوزش و یا هر علامت دیگر در ناحیه تناسلی را به عدم رعایت بهداشت ربط داده و با شستشوی زیاد با صابون و لیف سعی در بر طرف کردن آن می‌کنند. این کار کاملاً اشتباه بوده و منجر به تشدید خارش می‌شود. فروشگاه کاندوم اینترنتیشستشو بعد از هر بار ادرار و مدفوع با آب خالی و سپس خشک کردن به آرامی با دستمال کاغذی برای بهداشت ناحیه تناسلی کافیست. دنیای امروز دنیایی مجازی در قدم توا و بعد واقعیست. از این نظر شبکه‌های اجتماعی زیادی پدید امده‌اند. یکی از شبکه‌هایی که برای اشتراک عکس و فیلم است اینستاگرام نام دارد. ما در آموزش‌های گذشته چگونگی ثبت نام و چگونگی آپلود فیلم را آموزش دادیم. اما برای دانلود فیلم رایگانها چه کاری باید انجام داد؟ برای این کار روش‌های مختلفی است که ما به معرفی تک تک آنها می‌پردازیم. آبسه مقعدی چگونه درمان میشود؟تنهاراه درمان آبسه مقعدی ،تخلیه آبسه با ایجاد برش روی پوست محل آبسه است که معمولا در موارد آبسه های بزرگ و عمیق بیمار حتما در بیمارستان باید بستری و این عمل در اتاق عمل توسط جراح متخصص شقاق مقعد انجام شود. نمای کامپوزيت و ترموود با بهترين کيفيت و نازلترين قيمت در اسرع وقت در خدمت شما مشتريان گرامي مي باشد.